Making homemade vegetable stock has never been easier. Grab your slow cooker and some vegetable scraps and create a flavourful stock that’s perfect for soups and stews. I’ll show you how. I HATE wasting food. Seriously – it’s a pet peeve of mine. And there’s nothing sadder to me than having to throw out fresh produce. So each week I dig out the odds and ends in my crisper that need to be used up ASAP. First things first – I make a soup. Cannellini bean soup, to be exact. It’s very forgiving and is a delicious lunch or dinner for the times I can’t be bothered cooking. Next, I make vegetable stock. Well, if we’re being technical here there’s a little more to it. I gather up any veggies I haven’t used that are about to turn and dump them in a large ziplock bag and pop it in the freezer. I then use this bag to collect up any vegetable scraps from my cooking during the week. Then once I have a bag full of scraps / assorted vegetables I make a vegetable stock. In a slow cooker. Out of my kitchen scraps. YASSSSSSSS! It can be done. And once you try it, you’ll never want to go back to buying stock. STEP ONE: Get yourself a giant ziplock freezer bag and put all your vegetable scraps in it. The outside of an onion, carrot peel, celery leaves, mushrooms stalks… you see where I’m going here. Leave out seeds (like the inner part of bell peppers / capsicum) and cruciferous veggies like cabbage, broccoli, cauliflower and brussels sprout. This will cause your stock to become very bitter. Also leave out any mouldy / super gross vegetables. Once you have a full bag of scraps, the fun begins! STEP TWO: Give your scraps a quick rinse in a colander to remove any dirt. STEP THREE: Grab your slow cooker, dump the scraps in, cover with water and set on low for 12 hours. STEP FOUR: Place a colander over a large pot, and strain and discard the vegetables. STEP FIVE: Portion out the stock into airtight containers / mason jars. Keep it in the fridge for one week, or pop it in the freezer for up to three months. TIP: You could also portion the stock into an ice cube tray to easily add as a flavour base to recipe. 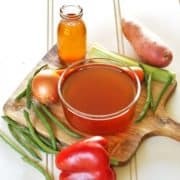 If you’ve tried this Homemade Vegetable Stock I’d love to hear how you went! Pop a comment and a star rating below! You can also FOLLOW ME on FACEBOOK, INSTAGRAM and PINTEREST to keep up to date with more delicious recipes. RECIPE VIDEO ABOVE. 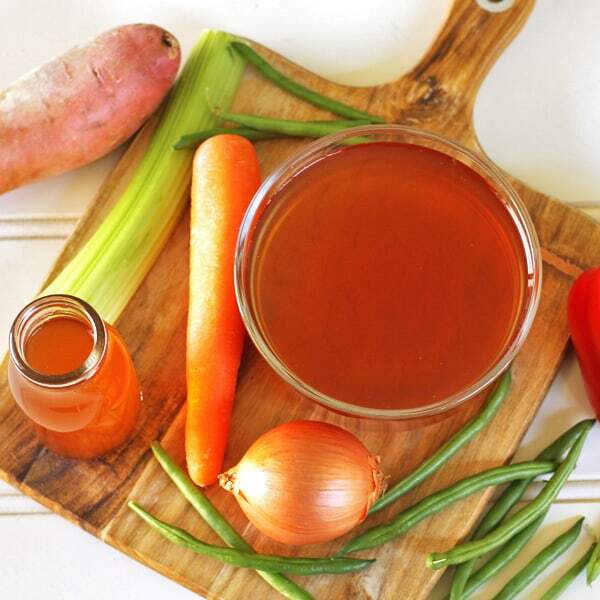 Making homemade vegetable stock has never been easier. Grab your slow cooker and some vegetable scraps and create a flavourful stock that's perfect for soups and stews. I'll show you how. Dump all ingredients into a slow cooker, being sure that you have enough water to cover the veggies. Then pop the lid on and set on low for 12 hours. Strain the vegetables & discard, then portion out the stock in airtight containers or mason jars. MUST HAVE: Make sure your vegetable scraps have some celery, carrot and onion in them for a flavour base. If you don't, throw some in. LEAVE OUT: Leave out seeds (like the inner part of bell peppers / capsicum) and cruciferous veggies like cabbage, broccoli, cauliflower and brussels sprouts. This will cause your stock to become very bitter. Also ditch any mouldy vegetables. RINSE: Make sure you rinse your vegetable scraps before popping them into slow cooker to remove any dirt. STORAGE: Stock will keep in fridge for up to 1 week or in the freezer for up to 3 months. INSPIRATION: Recipe adapted from The Healthy Maven. UPDATES: First Published July 19, 2018. Last Updated December 9, 2018 with more photos & tips. No changes to the recipe. NUTRITION: Nutrition information is a rough estimate based on 1 cup. 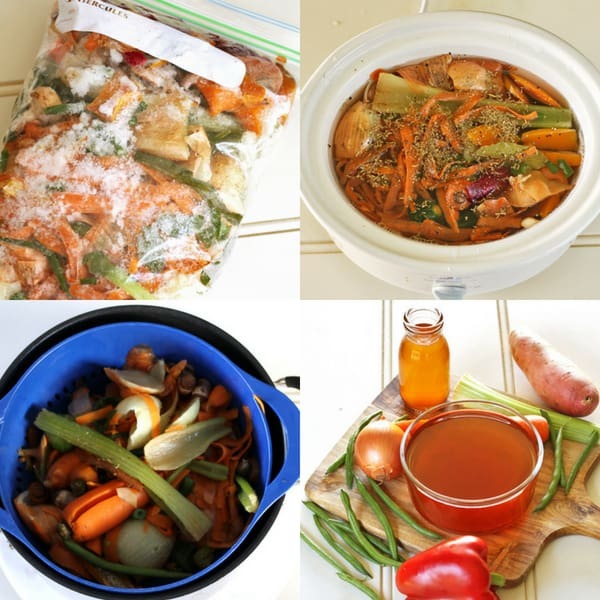 I love using my slow cooking to make stocks and using vegetable scraps is a great idea! Love this post! I need to try making some other flavoured stocks now.